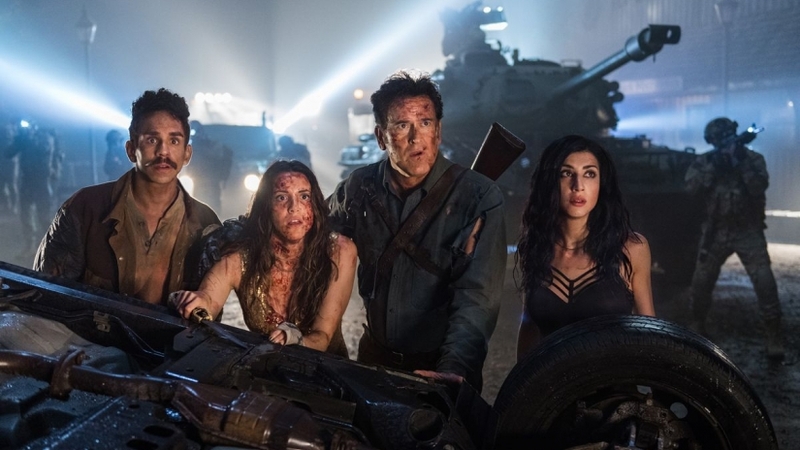 Ash vs Evil Dead has been coming to New York Comic Con every year since before its season 1 premiere in 2015. And why shouldn’t it, baby? In the halls of comic book geekdom, Bruce Campbell’s glorious chin is held in the same regard as the faces on Mount Rushmore, and his alter-ego’s chainsaw is more revered than any cherry tree-destroying axe. Of course Ashley J. Williams doesn’t just use his blade to cut wood. So it was an obvious delight when Campbell took the stage of the Hammerstein Ballroom in Midtown on Saturday afternoon, accompanied by his co-stars and fellow icons of the cult TV series, Dana DeLorenzo, Ray Santiago, and newcomers Arielle Carver-O’Neill and Lindsay Farris. Basking in that glow, Campbell cheerfully introduced the season 3 premiere episode four months before its Feb. 25, 2018 debut. He also gave some major hints about what to expect in the new year, such as potential time travel shenanigans and trips to the sperm bank.